Construction: The soul of your jacket. Do you know what’s inside your suit jacket? Many of us know how to pick the right fit or how to combine colors and patterns, but few know what a suit jacket or a sport-jacket is made of. Do you want to embarrass the store sales person or your annoying know-it-all-fashion-forward coworker? Ask them what type of construction is their jacket made of, and 9 out 10 won’t know the answer. Read below and you’ll impress the most expert fashion guru out there. Ever wondered why there’s so much difference in price between an off the rack commercial suit and a sartorially made one? E.g., between a Hugo Boss and a Brioni suit? It’s not just the fabrics as many of you think, but mainly the difference is in the construction of the jacket that, when full-canvass, requires at times up to 40/50 hours of handwork. The construction is very important because it will also determine the durability and not only the feel, look and fit. Let’s start with the cheaper one. Mass-market suits are made with a fused constructions. Walmart, Jos A Bank, Men’s Wearhouse, most of the Made in China productions use this type of construction. Obviously the manufacturing is cheap (zero hand work involved) and the jacket fabrics are fused (glued) to each other. The jacket is stiff and is not breathable at all (think of wearing an armor of glue on your chest!). After a few trips to the cleaners you’ll start to see bubbles on your chest piece, which indicates that the jacket is done. Do you really want to know more about this construction? This technique is today the most commonly used because it still carries some of the sartorial features without being too expensive. The canvasses – made with natural fibers such as horse or camel hair and/or wool – are placed between the jacket fabrics (front) and extend down to the pockets. Handwork is present with finishing touches such as buttonholes, small tailoring inside the construction, stitching along the lapels. The jacket keeps a good drape and move quite well with your body. Finally, the full canvass construction is the true sartorial technique to tailor a jacket. The canvasses are sewn inside the jacket by hand. Only a tailor can give it the right fastness by hand allowing the layers to move along the body when the jacket is worn. There is no glue at all which allows the jacket to have a natural look, along with being more breathable. It’s like a second skin. The more you wear the jacket, the more it’ll look good on you. In fact, the canvasses inside the jacket will shape with your body because of your body temperature! Very high-end brand adopt this type of construction for their jackets as their clients are used to look and feel the luxury of a garment that’s made by hand with passion by their tailors. Massimo Roma produces Italian custom made suits and jackets with either full and half-canvass construction. We NEVER use fused constructions. This way we are able to accommodate most of our clients’ budgets and deliver a suit/sport jacket that looks, fits and feels perfect…exactly what you expect from a tailor made garment from Italy. 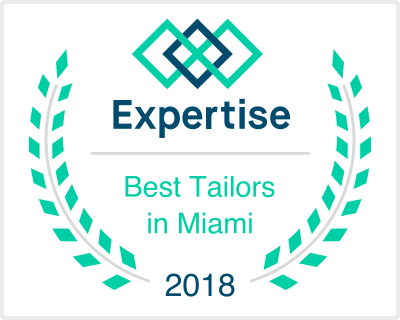 Book an appointment online or by phone (305) 998-0409 and let us help you build a truly sartorial wardrobe that reflects your professional and personal needs.